Are you ready to live like a royal? 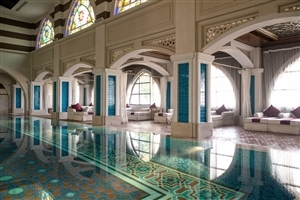 The Jumeirah Zabeel Saray has been inspired by the stunning imperial palaces of the Ottoman Era. With its traditional architecture and breathtaking attention to detail, upon entering the lobby you would be forgiven for thinking that you had stepped into the shoes of an Arabian prince or princess. The five star hotel is located on the western crescent of the world famous Palm Jumeirah, which is its own exclusive location - much like a palace! Look back over the Arabian Gulf at the magnificent Dubai skyline and let it take your breath away, or kick back and soak up the glorious Middle Eastern sunshine on the hotel’s own private beach. Each one of the 379 elegant guest rooms feature all of the amenities that you’ll need to have a comfortable and enjoyable stay, and the traditional turkish architecture will make you feel as though you are in your royal chambers. Bars and restaurants throughout the hotel are there for you to indulge in, and the man made island that houses the hotel continues to open a wealth of places for dinner, dancing and theatre. 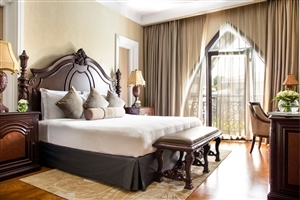 Guests of the Jumeirah Zabeel Saray can choose to stay on a bed and breakfast or half board basis. With 46 sqm of accommodation space and panoramic views of the breathtaking Arabian Gulf and the rest of the resort, the deluxe king room is the perfect place to relax, unwind and rest your head during your Arabian adventure. You can even soak up the glorious Middle Eastern sunshine on your own private balcony. If you’re staying at a five star hotel, you want to experience five star facilities. At the Jumeirah Zabeel Saray, they are passionate about ensuring that your stay in the hotel is as comfortable as possible, and that boredom is banned! A five star hotel would be nothing without delicious food and drink. With a choice of eight restaurants, which serve a variety of cuisines from around the world, and three stylish bars, you’ll be spoilt for choice when you head out for the evening. Al Nafoorah – Found on the right wing of the ground floor, this Lebanese restaurant is one of the finest for Arabic cuisine in Dubai. In a grand setting, there is a relaxed and regal atmosphere that’s perfect for dining out after a long day’s shopping or relaxing on the beach. Amala – Tantalize your taste buds with some authentic Indian flavours at this exquisite restaurant. Lalezar - Try some dishes that match the traditional Ottoman style of the hotel. As the first restaurant in the whole of dubai to serve Anatolian food, you can guarantee that the cuisine is as sensational as the decor that surrounds it. Imperium – Open from morning until late, this magnificent restaurant offers up fine French cuisine and international dishes, complete with magnificent views of the sea. The Rib Room – Speaks for itself! Try some delicious ribs here. Plaj – A relaxed family-friendly restaurant with Italian food, the ocean is the backdrop for this relaxed eatery. Fresh pasta, pizza, risotto and, of course, traditional Italian ice cream are all on the menu. 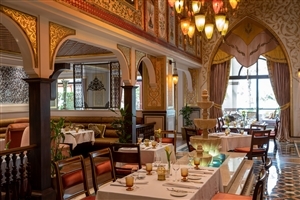 Sultan’s Lounge – Ottoman-inspired décor is found around in this bar that is open throughout the day and offers alcoholic beverages, Afternoon Tea and light meals. Club Lounge – On ‘The Avenue of Indulgence’, this is the place to speak to the concierge desk, check in and out, use the internet and drink a selection of beverages. Voda Bar – This one’s for all you night owls - a combination of sophistication and style makes this a great nightlife venue, complete with cocktails from expert mixologists. MusicHall – A dinner and dance experience, the MusicHall is a cultural venue with live music each night.